As many of us who suffer from Fibromyalgia or Chronic Fatigue Syndrome there is no cure for either of these illnesses so if we contract them we often find the only way we can obtain any form of relief is to treat the overlapping conditions caused by these conditions using prescribed or over the counter medication. Many people however believe that alternative therapies can provide a long lasting form of relief and as such are turning to these alternative therapies as a means of easing pain and the other effects of Fibromyalgia and Chronic Fatigue Syndrome. Chronic Fatigue Syndrome is also known as M.E (Myalgic Encephalomyelitis) and just like Fibromyalgia has no cure other than to treat each part of the condition with separate medications. Trigger Points are those parts of the anatomy that are most affected by Fibromyalgia and Chronic Fatigue Syndrome. There are eighteen trigger points in total and for Fibromyalgia to be diagnosed in a patient at least eleven of these trigger points must be causing constant – or near constant pain – for a period of three months or more. Again it is worth pointing out that these are the most common areas of the body to be affected but other areas of the body can be affected and this is evident on a case by case basis. 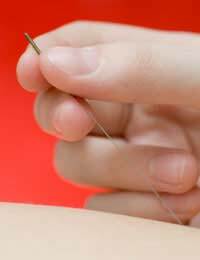 As you may know acupuncture is the treatment of injuries, allergies or phobias using hollow needles which are placed at certain points of the body in order to help relieve pain, anxiety, stress, addictions or phobias. The treatment of acupuncture has been around for many thousands of year and is now widely accepted in the west as an alternative therapy which has provided some surprising results. The idea of using acupuncture to treat either of these conditions is one that is widely accepted. However you should consult with your doctor before deciding to embark on such a course of alternative treatment. You should ensure before doing so that it will not in any way cause conflict with any prescribed medication you are currently taking. The process involves placing needles into the trigger points of the body that are most commonly affected by either Fibromyalgia or Chronic Fatigue Syndrome; this is designed to relief pressure to these trigger points and ultimately relieve pain. As with all therapies you should be prepared not to experience any reduction in pain straight away and you may need to have more than one session. Indeed your acupuncturist may suggest a course of treatments in order to ensure that all that can be done is being done. Your acupuncturist will ask you before beginning such a course of therapy about any illnesses, allergies or phobias you may have which may have an adverse bearing on the results. Just as you would give your doctor a detailed account of your condition you should do the same with your acupuncturist. You should always discuss your plans to undergo alternative therapies with your doctor before you do; he or she may advise on a different course of action or may recommend a support group you should consult with. Whatever you decide it is imperative that you seek the advice of your doctor before seeking any other kind of treatment and at all times you should keep your doctor appraised of any medications or treatments you are taking in addition to theirs.